The Algae Tube Facade regulates solar exposure with living microbes. Algal blooms create deleterious environmental effects for underwater life because they block vital sunlight and reduce the level of oxygen available to fish. Algae are incredibly beneficial, however, as a source of biomass for fuel and food. They also consume CO2, purify water, and may be used as an energy supply that does not compete with agriculture. The Algae Tube Facade system utilizes high-strength glass tubes filled with nutrient-rich water to grow algae in the presence of sunlight. Quick-growing plants rapidly produce biomass, thus creating interior shade and reducing glare while imparting a pleasing glow. The permeable system is ideal for mild climates in which cross-ventilation is desired, or may be applied as a rain-screen with an insulated back-up wall. Once the biomass has reached a peak growth state, it may be harvested via circulating pumps and new microbes introduced into the system. 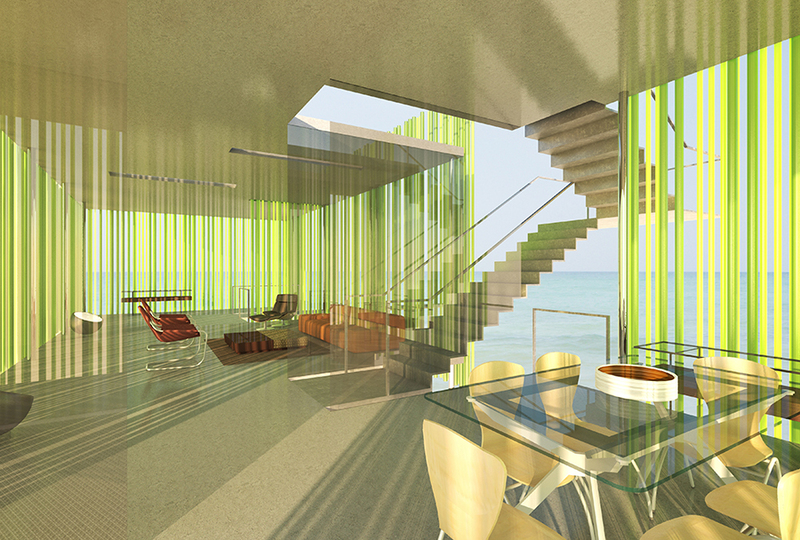 The Algae Tube Facade glows in the presence of sunlight while reducing direct glare.